Reports are very positive on Siri. Despite the obvious security concerns, if you have an internet connection it sounds like it really can work some magic. I wouldn't know first hand though. I'm not on the "s" line. My theory is people are either on the "s" line (3gs, 4s etc) or they're on the other line. The early termination fees encourage you to stay within your line. For a fee (for me currently $175) you can jump the line but otherwise you end up waiting for the next thing. While Siri, a better camera and getting rid of the hideous AT&T service are very temping, $300 for the phone + $175 for the early termination fee keeps me on the non-"S" line. The other day I got a call from an unfriendly Charter "security specialist" that was trying to inform me my bandwidth was being stolen. 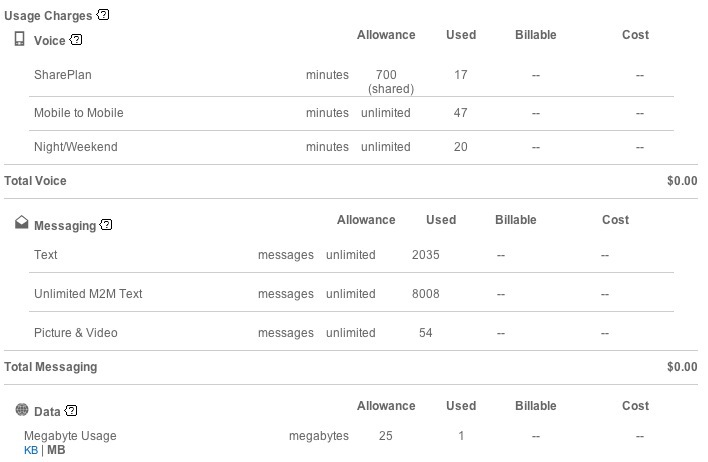 Evidently in the last month I had used 10x their unadvertised limit for my internet service. I told them that there was no way that someone else was using my bandwidth but that it was likely me from online backups, watching HD movies and the like. I told them I didn't know about any limits and they pointed me to some fine print in their "Acceptable Use Policy" which had been updated long after I first signed up for internet with them. When you sign up for plans or switch plans they never mention the limit, in fact you have to go looking for this policy to find it as its never sent to you or mentioned during sign up. Don't believe me? Go look at their plans on the site. 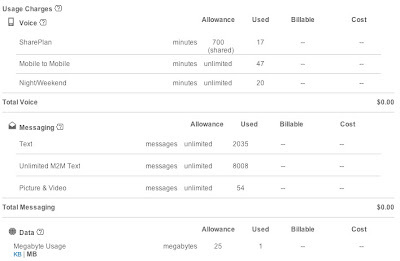 The plans mention the speeds but not the usage limits. Charter isn't alone in this practice. They told me if I continued that usage they'd cancel my service. I asked them what options I had and they went through the plans. For their "Max" package, which has 25Mb download speed and 3Mb upload speed the limit is 250GB/month combined transfer limit. This plan costs $55/month. If you start downloading at the max speed you use up your entire monthly allocation in 22 hours. Yes, for $55, you get less than a day of that advertised speed. If you only upload then it will take you 7 days to use up your limit. After talking to them they offered to sell me their "ultra" package. Thats 60Mb download, 5Mb upload and a combined limit of 500GB/month. For this price of $100/month you use up your allowed limit within 18 hours at full speed. If you only upload then it will take you 9 days to use up your limit. What a deal. The limits sound ok when you put them in terms of HD movis. HD movies (according to the charter rep) are 8GB in size, and SD movies are 2GB. So I could watch 31HD movies a month with the "max" plan. But when you work in online backup then things go crazy. They suggested rather than watching HD movies I should watch SD on my HDTV and to try to limit my use of the HBO Go that they have been advertising since that uses bandwidth too. And that online backup program (Jungledisk, Carbonite, Mozy, etc) should be turned off because my $64 1TB drive will take too much bandwidth to back up online. In other words, they advertise great speeds but you can't really use what they sell you. Since they're a monopoly and there are literally no other providers where I live, I ended up switching to Charter Business. There for $129/month I get 25Mb download 3Mb up but there are no limits. So I can actually use every bit of the speed i've been sold for the entire month and actually do the things they advertise that you can use your internet for. This industry needs change. I've been using Mailplane for the last several months due to the fast search, lack of sync issues, and other things you get with a more-native google mail experience. With the new updates to Apple Mail I figured i'd go back to trying a typical local client. The details of that experience are yet another post, here i'll just talk about the differences between the old OSX mail and the new one. Apple added an archive button like they did on the iPhone and the iPad to mail. Thats a nice addition, but unfortunately it doesn't work like it does on the iPad and iPhone. On those other devices the button actually archives your mail to the Google "All Mail" folder. On OSX it sticks the mail in [IMAP]/Archive so then you end up with 2 copies of archived mail from your Apple mail client if you're using google mail -- one in [IMAP]/Archive and one in "All Mail". So they added the archive concept, but for everyone and completely ignored the Google mail use case. We've seen other oddities in using Apple mail with google before and there was the option to "Use this mailbox for" junk/sent etc. Well the new Archive is not one of those. Apple did a half-baked job here. Google mail is here to stay and better integration with it would be nice. For now i'm still on OSX mail but probably not for long given how poorly it works with gmail. Beyond that, the new conversation views are nice, again another nod and ripoff from gmail. Apples new 3 panel view is better suited to wide screens but its hit or miss with people. Probably about 50% of the people I know hate it and want it set back to the old layout. The search seems much better now and actually finds things and to me this is the biggest improvement in mail and the reason I didn't immediately switch back to the google interface. Still, if your mail is served up by Google, Apple Mail is a poor tool for it if you get a lot of email. This is Apples new App launcher for OSX trying to do for OSX what they did for the iPad and iPhone. Personally I still think the app launcher has a lot of maturing to do on those other devices, and here on OSX its actually much worse. First, you have more apps on OSX so you end up with more screens of them. Not only that the icons are HUGE. Multiple screen management is a pain, made somewhat easier by iTunes but you can't do that on the OSX version. You also can't remove Apps from the launcher on OSX so you have a LOT of them -- even the silly ones you don't care about. And after you upgrade you have a huge organization job to do if you want it all organized reasonably. On top of all that I crashed it frequently. I've taken it off the dock, shortcuts etc and forgotten about it. Its dead to me. This is the new replacement for spaces. To be honest I liked the old one better. It was easier to configure and use and I could better pick what ran where and in which direction I could find it. The old spaces allowed spaces in 2 dimensions, now you can only have spaces in a single dimension. Also some apps that used to run in multiple spaces fine (tell the app to be assigned to "all spaces") no longer work in multiple spaces (EyeTV for example). Perhaps those vendors need to fix them but for now its broken/worse. Another annoying thing to me is the dashboard is one of your spaces. While it may make sense for some that use the broken/worthless dashboard, for those that don't it would be nice to turn it off/forget about it. That was a failed concept, why bring it back to my attention again? Anyway, I use mission control since I have no choice, but I would have preferred if they had left it alone. OSX now saves all your open files when you quit your apps. This sounds great but its actually REALLY annoying. You're reviewing a word document someone emailed you, you quit word. 2 days later you open an unrelated document and, bam, the document you were looking at a couple days ago pops up. Thats distracting/confusing/annoying. It would be nice to have this setting only on app crashes or, better yet on a per-app basis, but otherwise i've shut it off -- it makes no sense in its current form. Everyone i've spoken to about the upgrade has complained that Apple literally inverted the scroll functionality with Lion. Few have gotten used to it and most have changed the setting to scroll the way it did before. Combine that with jumping between PC and Mac and virtualization and you have a big mess. What were they thinking? For now i've kept it with the Lion default myself just to see if I can get used to it. Im getting there. Slowly. The support for full disk encryption now is really nice, thats a great feature. But at the same time they killed home folder only encryption. This means encryption is all or nothing. Thats terrible. I have some data that needs to be encrypted and some that I do not need encrypted and don't want to pay the performance penalty for it. Data I don't need to be encrypted is large, things like iPhoto and iTunes libraries etc. Why did Apple not do the reasonable thing and add folder-level encryption in addition to whole disk. That would have been the best of both worlds. But, again, they blew it. Auto save may well save my bacon some day, but for now its been a pain. I recently opened a file, made some changes, and saved it as a new name and quit. Then when I opened the original file again I found my changes were in the original too and I had to go through a fancy and slow graphic experience to get the original file back that I had never saved. There don't seem to be any settings to turn this off either, if you could I probably would. Address book - new look is ugly to me, I wish they had left it alone. Airdrop - At home its more work than should be needed to move files around. At work I have a shared NAS. I think the sole use case here is a small office environment where they didn't get a NAS yet. FaceTime - already had it (paid for it via App store). I've only used this to play with it though. They still didn't reconcile this with the iChat video chat. Why do we need to video chats created by Apple? Finder - some of the tweaks are nice. But they're tweaks. I wish they had made Finder more resilient to hangups from slow drives etc. Its still bad in that regard. Full screen apps - I work with multiple apps at the same time and i'm not ADD distracted by other windows. I can't find a use for this. iCal - I don't use it, its junk. I use Google Calendar wrapped in fluid. That works like magic. They could have deleted iCal for all I care. iChat - this actually had some really decent updates, not the least of which is supporting other chat protocols. I was using Adium all the time and now i'm using iChat all the time. Apple may have just killed Adium for me. Safari - I was using Chrome, I'm trying safari again. The big draw here is the bookmark syncing with my i-devices and the new reading list (which kills instapaper for me). The draw to chrome was better functionality, better incognito and the speed. Safari so far is pretty quick. Per user screen sharing - great idea, but so far my use of this has locked up the machines in question. When it works it will be a good improvement but for now it doesn't work for me. Anyway, as I said at the beginning of this post, Lion is mostly a series of small updates to me. I was traveling when Lion came out so I got to miss the mass rush to download it etc. But about a week after it came out I gave it a shot. I bought it and downloaded it and started the install. It gave me all sorts of not-well-defined warnings about installing on a RAIDed volume. My OS disk was an Apple Software RAID RAID-1 volume. Lion told me it wouldn't create a recovery partition for me and sort of implied there may be other things I wouldn't get if I proceeded. I didn't like that so I un-raided the volume before continuing, but it makes you wonder if Apple really supports their own software RAID. The install went clean after that (first impressions in another post) and I moved on to my next machine. The next machine was my wife's. We're on the Apple MobileMe family pack but because Apple really has no concept of a family group etc, I couldn't just download the package from her App store account because to apple we're unrelated even though both app store accounts are tried to the same family account. Fortunately, from the broken RAID install earlier I had saved off the Lion installer. Rather than login as myself etc on her machine I just copied the installer over and ran it which worked fine. Apple really needs to figure out this family stuff -- its been a mess for years. The next machine was my laptop from work. That one had file vault on it. I copied the installer over (rather than re-download 4GB) and ran it. The installer took 3 minutes and rebooted to continue but just came back to snow leopard. Did that another time with the same results. What was going on? Turns out I had copied the installer to the desktop and ran it from there. Well, the desktop is encrypted if you have file vault turned on so when the machine rebooted and I was not logged in it couldn't get at the installer to continue installing so it just reverted. The solution was to copy the installer to the /Applications directory (where Apple downloads it to normally) and then the install went clean. You'd think their pre-install check would look for this sort of thing. I upgraded my desktop machine too at work with no issues after this. All in all it was pretty much what you'd expect from Apple. The edge cases have a few wrinkles but nothing disastrous and things run after you've upgraded. Being in the software industry this is no small thing although you'd think with the numbers of beta testers they have etc they could cover these not-so-edge cases a bit better. I'll post some impressions in my next post. I started thinking about the role of the cell phone in our culture. Its how we communicate. Whether its the old phone call approach (look at her minutes used though), or TXT messages, facebook, twitter etc its always with us. Whether or not we have GPS features enabled on the phone the phone can be triangulated by the cell phone towers which is a feature companies like Apple and others have used for better maps/GPS/navigation support. So you can be tracked unless you turn it off. In the last year or so an increasing number of companies have begun working on the ability to make payments with your cell phone. You can already do this in a very limited manner at some places like Starbucks. There are speculations that Apple's upcoming iPhone 5 will have this ability (my bet is that it wont make the cut since its more like an iPhone 4gs than a true iPhone 5). Either way the day is coming. And from a commercial point of view it makes a ton of sense. Kids get cell phones LONG before they get credit cards. Turn that cell phone into a payment device and you've just created a whole new class of payers. But, I have to ask, is the cell phone the mark of the beast? The second beast forces all people—important and unimportant, rich and poor, free and slaves—to be marked on their right hands or on their foreheads, so that no one may buy or sell unless he has the mark, which is the beast's name or the number of its name. Most people are right handed. They have this cell phone thing in their hand or attached to their head (bluetooth headsets etc). You may someday not be able to buy or sell without it and you can be identified at all times by it. Am I crazy? Either way where things are going is a bit frightening. For the last couple of months i've been using the free desktop app Reeder as the client to read my RSS feeds. I've tried several desktop apps but to date Reeder was the one I liked the best. It wasn't perfect, but it was free and it seemed a little less clunky than the native google reader interface. Regardless of what tool I use, its always connected to my google reader account these days. That allows me to pick the best app on each platform but still maintain consistency in keeping up on the news. The Reeder beta finished and now they want $10. Thats a reasonable price for good software, but since it didn't just switch on ads or cripple the app but literally disabled it I jumped back to the native google reader interface until I could make a decision. And you know what? The native google reader app improved and its hard for me to say the local app is better. So I uninstalled Reeder and went back to the google reader interface wrapped in fluid to make it an app and I haven't missed Reeder yet. The killer will come when I need to read RSS offline, but these days I don't travel with my mac but with an iPad and iPhone. The other killer is when you buy an app like Reeder on one platform they don't give it to you on the others. I have no idea what Reeder looks like on the iPad or iPhone since they don't have a lite/free version and i'm actually quite happy with the free MobileRSS. If Reeder sold the desktop app on the Mac for $10 and included the mobile versions with that i'd consider it, but otherwise its not going to happen. When vendors really make their apps work offline with HTML5 it will really but a strain on the local desktop app vendors. And competition is good for the consumers. A while back I wrote about Netflix vs Redbox and that i'd moved over to Redbox. Today's news has Netflix as largest source of streaming content in North America. After I got the AppleTV a while back I re-subscribed to Netflix and have actually been using both streaming (very lightly) as well as their lowest unlimited subscription (1 at a time) alongside Redbox depending on the need etc. Redbox was bugging me for a few reasons. I had to stop to get/return the DVDs and sometimes I forgot to return the disc. At other times when I went to just return the disk the line was long and I had no time to wait around while people browsed for the movies they wanted to watch. There are competitors to Redbox that exist only because they have 2 interfaces that can be used at the same time -- one to rent and one to return. Then the final straw was that Redbox for whatever business reason took out the only 2 Redboxes I pass on my 90 minute round trip commute. Both were at Xtramart stores on Route 146 in MA and perhaps there's some relationship issue there. But now its very inconvenient for me to pick up or return a DVD from them. The only one within 20 mins of my house now is at a grocery store and its always busy and the place is a zoo anyway. While i'm not a believer yet in Netflix on the streaming side because its library is hideously limited, right now they have the edge for me since I can get movies from them in a couple different ways and its more convenient. Will be interesting to see how this all plays out in the long term. How long can the $5 PPV rentals last and how long before Netflix stops mailing DVDs around the country? Its been a while again since my last post, but a recent experience got me fired up. I've been meaning to post (gripe?) about the confusion between Google accounts and Google Apps accounts for quite a while. Google made a mistake in the early days in letting you have both types of accounts with the same email address. This created a lot of confusion as people think of their identity as their email address but found that there were multiple profiles and sets of data associated with that email address. Google is now trying to clean that up and i've had the pleasure of experiencing that. Its not pretty. What they essentially do is if you have a google apps email address that conflicts with a normal google email address they rename the normal google email address to something different, like "foo%domain.com@gtempaccount.com" then for a few of their products they automatically migrate the data over for you. For the rest they have help available for how you can do it manually. Not all of of these solutions work and each is different. Google also doesn't indicate the odd states you can get in along the way. After the initial migration things were OK for me, not everything migrated, but from the web the things that did were accessible. But all my authentication failed on my iPhone, OSX Apps etc. The applications could no longer authenticate with my Google account because the accounts were in a messed up state. Google provided no help on this and after much searching I found a thread that told me what had to be done. The net is that I had to change that temp email address they had assigned to something else. Once I did that all my apps on the iphone and desktop started authenticating and worked fine. Again I had no indication from Google that I needed to do that, things just broke. After that I spent an hour iterating through the list of google services and making sure I had migrated their data. The final step is to blow away the Google account (not google apps account) but i'll wait a bit to make sure I have everything I need to do that. Software development is difficult, predicting future messes is especially hard but for millions of people to go through this is inexcusable. Only because their products are free can they get away with this sort of thing and its part of the reason Google has not really found a way to make money beyond ads. Back when my last company sold I was crazy busy flying all over the world and my wife decided to remodel the family room. I knew I wanted a better TV/sound setup so I upgraded from a 32" TV to a 55" but to get the speakers installed and the whole thing cabled with the components hidden I went with the recommendation of her interior decorator to use a local company, Sounds Good Corporation. They did a first class installation job but they made a critical mistake. They recommended a Control4 Home Automation system to control everything. It could handle the hidden components via RF and remote IR as well as handle MP3s etc. The system worked and worked well for a few years but it had one fatal flaw -- you cant manage it yourself. Recently I finally broke down and bought an AppleTV (more on that an a different post) but when I went to connect it to the system I couldn't since end users are not allowed/able to change settings on it. I called Sounds Good and they said I need an annual contract ($150) and that covers one service call and each service call after that is $50. Thats nuts. My request was to change the input on the TV from input 5 to input 7 and they wanted $150. Mysteriously, right after I got their pricing on this and told them there was no way I was going to pay them $150/year, my system stopped working completely. Thats odd given the 2 years it worked fine up to that point. The timing is suspicious. Either way I was done with them. Putting something in your home you can't update/manage yourself is a mistake for most people, and especially bad for me. Shame on me for letting it happen but my eyes were not on the ball at that point in my life. Sounds Good also made a terrible customer service mistake for wanting to charge for minor updates (that they can do remotely) as i'll never work with them again. They picked a product not necessarily because it was the best but because it guaranteed revenue in the future. A year ago I wanted an update for the system and they wanted $250 for a software update to it just so the software knew what an iPod was (that price excluded the dock). Thats just nuts. I ordered it from Amazon and it arrived for last weekend. It took me 3 hours to rip the garbage Control4 system out of my setup and install the remote and get it working with everything and tie wrap up all the cables nice and clean again. Since my devices are inside a cabinet and behind the TV and generally in odd places I got the Logitech Precision IR cables to go with it. Logitech's documentation generally stinks for figuring out how to control multiple devices with RF and how to reach them. The precision IR cables weren't even mentioned anywhere, I heard about them on the forums. Anyway, now everything is hidden and I can control all the devices I controlled before plus my new AppleTV. The PS3 control is actually better since now I can control power too which I couldn't before. The Wii is the only unmanageable device but since its not my DVD player or multimedia player its not a big deal. Good riddance to Control4. I'd never recommend that product and you should think twice about working with a company that recommends it. Wow, my last post was August. Where did the time go? I have to admit, I didnt expect much out of it and mileage does vary, but it works. It saved me a ton of ladder moving today and I got the house and one barn done, one left to go (the big one). I wouldnt advise running it when the horses are nearby though -- it does make a racket. The big thing to remember is to go slowly and back up and go forward for the tough stuff. Lots of big oak trees near us so there's a ton of stuff in the gutters. It held up and ran for several hours and I ran out of time before it did. If you have a lot of gutters or are just a gadget freak, give it a shot.